The RVCA and its partners are working to protect and enhance environmental conditions in the Middle Rideau Subwatershed. Figure 27 shows the location of all stewardship projects completed in the Rideau-Merrickville catchment along with sites identified for potential shoreline restoration. From 2009 to 2014, seven septic system replacements, four erosion control projects, three well decommissionings, three well upgrades, one well replacement, one livestock fencing project, one milkhouse washwater treatment facility and one windbreak buffer were completed. Between 2003 and 2008, seven septic system replacements, five well decommissionings, three livestock fencing projects, two well upgrades, one windbreak buffer, one erosion control project, one fuel storage and handling facility, one nutrient management plan and one wastewater runoff project were carried out. Prior to 2003, three livestock fencing projects, two septic system replacements, one milkhouse washwater treatment facility and one manure storage facility were completed. Total value of all 50 projects is $380,843 with $207,425 of that amount funded through grant dollars from the RVCA. 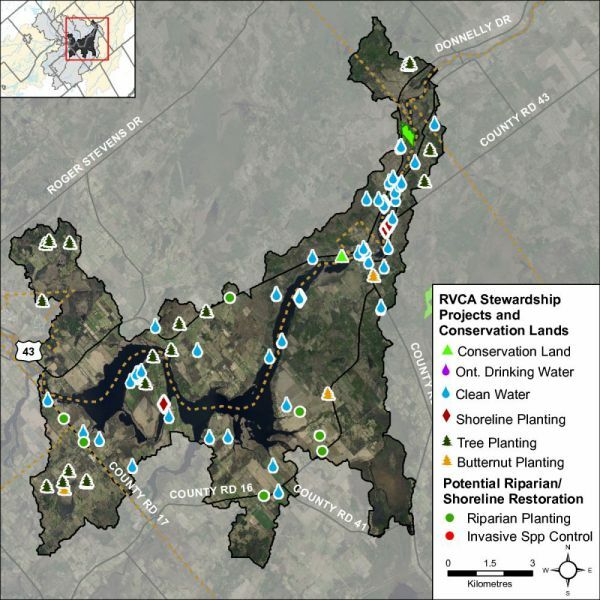 The location of RVCA Tree Planting Program projects is shown in Figure 27. From 2009 to 2014, 18,000 trees were planted at two sites. Between 2003 and 2008, 20,476 trees were planted at six sites and prior to 2003, 28,355 trees were planted at 10 sites, resulting in the reforestation of 35 hectares. Total value of all 18 projects is $186,978 with $58,904 of that amount coming from various fundraising sources. Through the RVCA Butternut Recovery Program, an additional 60 butternut trees were planted in the Rideau-Merrickville catchment between 2003 and 2014, as part of efforts to introduce healthy seedlings from tolerant butternuts into various locations across Eastern Ontario. With the assistance of the RVCA’s Shoreline Naturalization Program, 963 trees and shrubs were planted at six project locations to create a 722 metre long shoreline buffer at a total project value of $4,183. The Rideau-Merrickville catchment covers 116 square kilometres with 31.3 square kilometres (or 27 percent) of the drainage area being within the regulation limit of Ontario Regulation 174/06 (Figure 28), giving protection to wetland areas and river or stream valleys that are affected by flooding and erosion hazards. Wetlands occupy 22.2 sq. km. (or 19 percent) of the catchment. Of these wetlands, 12.4 sq. km (or 56 percent) are designated as provincially significant and included within the RVCA regulation limit. This leaves the remaining 9.9 sq. km (or 44 percent) of wetlands in the catchment outside the regulated area limit. Of the 176.1 kilometres of stream in the catchment, regulation limit mapping has been plotted along 86.3 kilometers of streams (representing 49 percent of all streams in the catchment). Some of these regulated watercourses (31.1 km or 18 percent of all streams) flow through regulated wetlands; the remaining 55.2 km (or 64 percent) of regulated streams are located outside of those wetlands. Plotting of the regulation limit on the remaining 89.7 km (or 51 percent) of streams requires identification of flood and erosion hazards and valley systems. 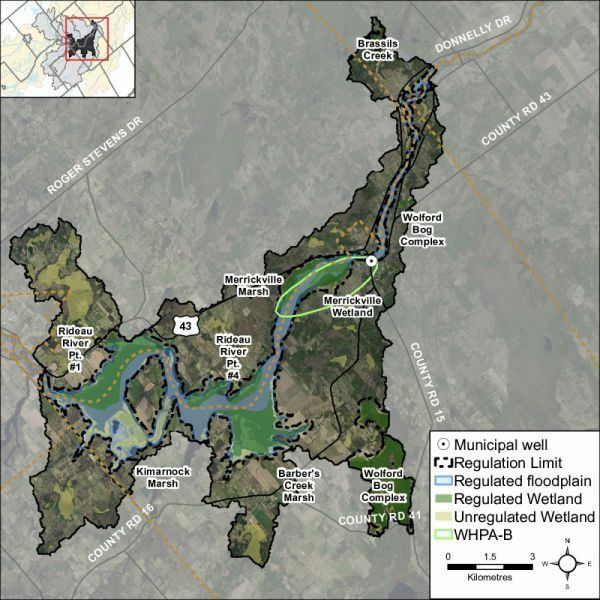 The Wellhead Protection Area around the Village of Merrickville municipal drinking water source is located within the Rideau-Merrickville drainage catchment (Figure 28). This area is subject to mandatory policies in the Mississippi-Rideau Source Protection Plan developed under the Clean Water Act. These policies specifically regulate land uses and activities that are considered drinking water threats, thereby reducing the risk of contamination of the municipal drinking water source. With the exception of the area around Kilmarnock, the Rideau-Merrickville drainage catchment is also considered to have a Highly Vulnerable Aquifer. This means that the nature of the overburden (thin soils, fractured bedrock) does not provide a high level of protection for the underlying groundwater making the aquifer more vulnerable to contaminants released on the surface. The Mississippi-Rideau Source Protection Plan includes policies that focus on the protection of groundwater region-wide due to the fact that most of the region, which encompasses the Mississippi and Rideau watersheds, is considered Highly Vulnerable Aquifer. The lands adjacent to the Rideau River are also considered a Significant Groundwater Recharge Area. This means that there is a volume of water moving from the surface into the ground and groundwater serves either as a municipal drinking water source or supplies a lake or stream ecosystem. The Plan was not required to include policies to specifically address Significant Groundwater Recharge Areas.